Music and better hearing: what's the connection? Here’s some good news for all the shower crooners and car radio rock stars out there -- in addition to reducing stress and increasing mental alertness, your hobby may also benefit your hearing. Specifically, it might improve the way you understand conversations which take place in noisy places. Dr. Russo's choir getting pitch-perfect. That’s the preliminary finding of a study conducted by Frank Russo, professor of psychology and director of the Science of Music, Auditory Research and Technology (SMART) Lab at Ryerson University in Toronto. Professor Russo and his SMART Lab colleagues study music’s effect on the brain. They are also interested in how aging affects hearing. Their research made them wonder -- why do older adults have trouble understanding speech in noisy environments? 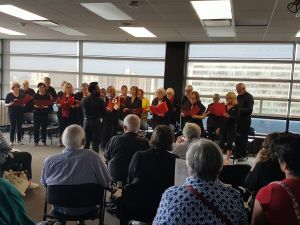 To test their hypothesis, Professor Russo and graduate student Ella Dubinsky reached out to some of the older adults with hearing loss in Russo's database and asked them if they wanted to join a choir-- no musical experience needed. Participants signed on for a 10-week session which included vocal lessons, choir practice, computer homework, and, just for fun -- a performance at the end of their training. The first group was organized in 2014, the most recent concluded their voice training the first week of July, 2017. In addition, the researchers established two other control groups. One simply listened to music while the other had no musical intervention at all. Periodically, researchers used scalp electrodes to track the auditory brainstem responses of participants in all three groups. Professor Russo said this allowed his team to measure how well the brain was coding sound, especially how it responded to specific speech patterns such as the steady portion of speech corresponding to vowels. The result? The studies determined that the choir group’s brainstem response to sound improved after singing training. The other two groups showed no improvement. Besides, most people have some experience singing, even if it’s just in elementary school music class. And, Russo said, chances are good everyone can sing -- even those who may have been told otherwise along the way. Professor Russo said the number one complaint from older adults is that they have trouble hearing speech in noise. And while hearing aid technology has come a long way, they don’t completely address the problem. In the future, Russo and his SMART Lab colleagues hope to expand the study to include individuals who wear hearing aids. They’re also interested in studying how long the benefits last and exactly why this activity improves speech in noise comprehension. There are also ways to improve your hearing even before you sign up for that community choir. The first step is to have your hearing tested by a qualified hearing care professional.. Hearing aid technology is available today to help you hear all the sounds of life, including your favorite music.